Alleged New People’s Army (NPA) leader Pedro Lumantas was arrested Saturday, June 16, 2018, while confined in a hospital in Tagbilaran City, Bohol. 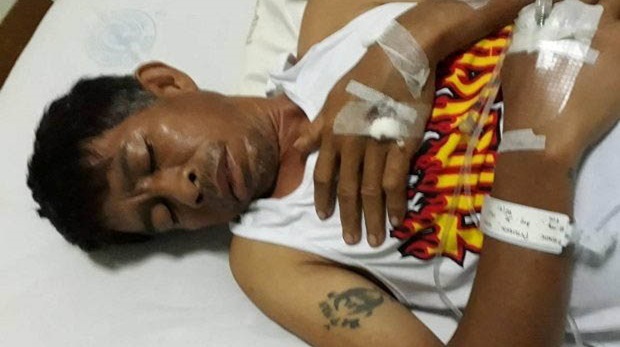 Government security forces have captured a suspected ranking official of the Communist Party of the Philippines-New People’s Army (CPP-NPA) while admitted at the Ramiro Hospital in Tagbilaran City on Saturday. In a statement, the Philippine Army’s 47th Infantry Battalion identified the suspect as Pedro Lumantas, also known as Dadoy, Andoy, and Didoy, the alleged deputy secretary of the Bohol Party Committee, the Komiteng Rehiyon Southern Bohol. Lumantas was captured by combined military and police operatives by virtue of an arrest warrant for multiple murder charges while he was getting medical treatment for a gunshot wound at said hospital. Lumantas has been turned over to the police for proper disposition. Authorities said Lumantas was allegedly involved in “a series of atrocities” in Cebu and Bohol, including the recent “merciless killings” of two members of the Citizen Armed Force Geographical Unit (CAFGU) last April and May. First Lt. Elma Grace Remonde of the 47th Infantry Battation, 3rd Inafantry Division (Spearhead) based in Tubigon town, identified the victims as Paulino Banga and Edwin Bugahod who were killed in Barangay Dagohoy, Bilar on March 28 and Barangay Rosariohan, Batuan on May 16, respectively.